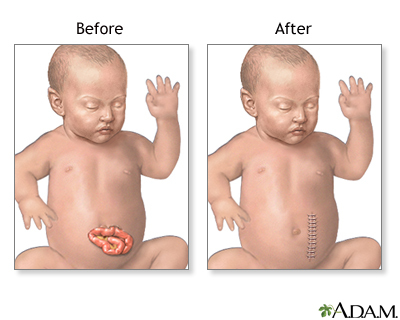 Gastroschisis repair is a procedure done on an infant to correct a birth defect that causes an opening in the skin and muscles covering the belly (abdominal wall). The opening allows the intestines and sometimes other organs to bulge outside the belly. If possible, the surgery is performed the day your baby is born. This surgery is done when there is only a small amount of intestine outside the belly and the intestine isn't very swollen. Right after birth, the intestine that is outside the belly is placed in a special bag or is covered with a plastic wrap to protect it. Your baby is then prepared for surgery. 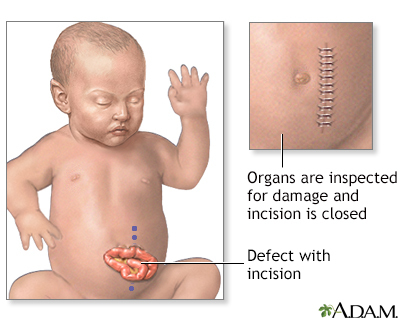 The surgeon examines your baby's intestine (bowel) closely for signs of damage or other birth defects. Unhealthy parts are removed. The healthy edges are stitched together. The intestine is placed back into the belly. The opening in the wall of the belly is repaired. Right after birth, the baby's intestine and any other organs that are outside the belly are placed in a long plastic pouch. This pouch is called a silo. The silo is then attached to the baby's belly. The other end of the silo is hung above the baby. This allows gravity to help the intestine to slip into the belly. Each day, the health care provider also gently tightens the silo to push the intestine into the belly. It may take up to 2 weeks for all of the intestine and any other organs to be back inside the belly. The silo is then removed. The opening in the belly is repaired. More surgery may be needed at a later time to repair the muscles in your baby's belly. Gastroschisis is a life-threatening condition. It needs to be treated soon after birth so that the baby's organs can develop and be protected in the belly. 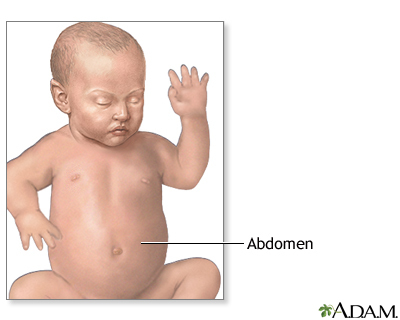 Breathing problems if the baby's belly area (abdominal space) is smaller than normal. The baby may need a breathing tube and breathing machine for a few days or weeks after surgery. Inflammation of tissues that line the wall of the abdomen and cover the abdominal organs. Problems with digestion and absorbing nutrients from food, if a baby has a lot of damage to the small bowel. Temporary paralysis (muscles stop moving) of the small bowel. Gastroschisis is usually seen on ultrasound before the baby is born. The ultrasound may show loops of bowel freely floating outside the baby's belly. After gastroschisis is found, your baby will be followed very closely to make sure he or she is growing. Your baby should be delivered at a hospital that has a neonatal intensive care unit (NICU) and a pediatric surgeon. A NICU is set up to handle emergencies that occur at birth. A pediatric surgeon has special training in surgery for babies and children. Most babies who have gastroschisis are delivered by cesarean section. After surgery, your baby will receive care in the NICU. The baby will be placed in a special to keep your baby warm. Your baby may need to be on a breathing machine until organ swelling has decreased and the size of the belly area has increased. A nasogastric (NG) tube placed through the nose to drain the stomach and keep it empty. Fluids and nutrients given through a vein. Feedings are started through the NG tube as soon as your baby's bowel starts functioning after surgery. Feedings by mouth will start very slowly. Your baby may eat slowly and may need feeding therapy, lots of encouragement, and time to recover after a feeding. The average stay in the hospital is a few weeks up to a few months. You may be able to take your baby home once he or she is taking all foods by mouth and gaining weight. After you go home, your child may develop a blockage in the intestines (bowel obstruction) due to a kink or scar in the intestines. The doctor can tell you how this will be treated. Most of the time, gastroschisis can be corrected with one or two surgeries. How well your baby does will depend on how much damage there was to the intestine. After recovering from surgery, most children with gastroschisis do very well and live normal lives. Most babies who are born with gastroschisis do not have any other birth defects. 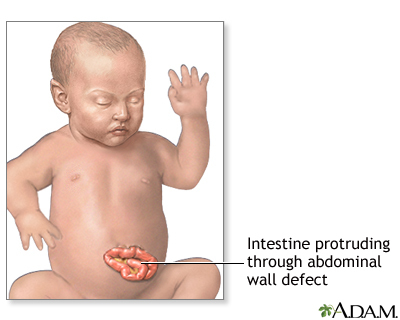 Islam S. Congenital abdominal wall defects. In: Holcomb GW, Murphy JP, Ostlie DJ, eds. Ashcraft's Pediatric Surgery. 6th ed. Philadelphia, PA: Elsevier; 2014:chap 48.